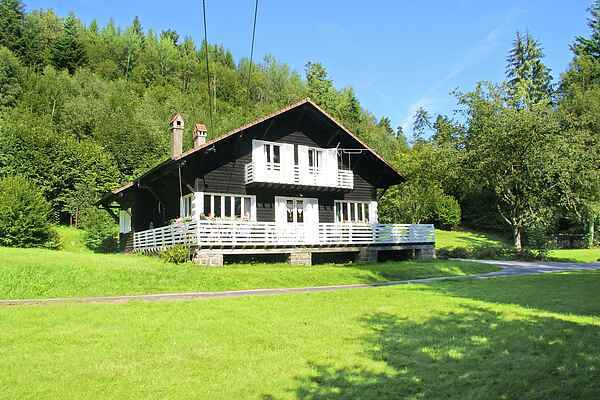 This large, warmly decorated chalet is on the edge of a dense forest. Located on a quiet cul-de-sac 300 metres away, this chalet is surrounded by plenty of grass and trees. It is in a beautifully sheltered location, and the hills begin right behind the house. You'll feel at home in no time once you step inside. An atmospheric living room with a seating area and a fireplace. Open the doors towards the long balcony with seating and a parasol. A wonderful place to start reading a new book while enjoying a cold drink! A wonderful holiday lifestyle! The countless idyllic country paths winding through the mountainous landscapes are perfect for breathtaking walks. The valley village of Saint-Léonard is in a beautiful central location for amazing outings. It's not a bad place for a bit of shopping either! St. Dié (9 km), with museums and a cathedral lies to the north, while to the south is the well-known Gérardmer (20 km) with a glorious swimming lake and a beach, where you can try out a range of water sports. One of the most-visited locations in France is the castle of Haut-Koenigsbourg (52 km). Be sure to visit the free roaming monkeys at La Montagne des Singes!